My co-worker and I have been complaining to each other about our irritating issues with heart burn we’ve had recently. Not one to usually suffer from this ailment, I have had increasing bouts in the past several years after my stay in the hospital for a surgical procedure. The anesthesiologist insisted on pumping my IV with Prilosec. She said it would lower stomach upset and vomiting, common side affects of the anesthetic used during surgery. We battled one another as I demanded she listen to my request and honor my refusal of Prilosec. The after affects would be much worse, she contended. I said I was willing to take my chances. I knew the evils of this nasty drug and I did not want it. Frustratingly, she gave it to me anyway and the results were disastrous. I’ll spare my readers the awful details, but I will tell you I suffered horrible heartburn and acid reflux daily for five full months after my surgery. I had the most difficult time enjoying food. I could not eat without pain. My beloved coffee was the worst culprit. I reluctantly gave it up. I felt horrible. Heartburn ruled my life. When I was fed up enough with my anguish I sought out more permanent relief. I could not imagine suffering at this level for much longer. I began researching natural relief from heartburn. I finally made an appointment with my naturopath to get her advice when all other attempts failed. She prescribed a probiotic with 20 billion CFU. This is when I learned about the amazing benefits of this wonderful supplement. It helped to restore beneficial bacteria in my belly and prevented the overgrowth of bad bacteria as well as naturally lowering my stomach acid. She helped me come up with a new diet plan to incorporate healing foods and I was on the path to recovery. Within a month my symptoms were gone. As I healed I began to integrate my regular diet back into my life. I eased back in to coffee drinking; a love (and addiction) I truly enjoyed. Things were back to normal for me and I felt good. Over the years I have had a few mild cases of heartburn that resolved quickly with some temporary diet changes. Recently though I have been suffering again, rather severely. I made diet changes to no avail, I lowered my coffee intake, but just cannot eliminate it completely. The pain of caffeine withdrawal is not something I want to endure. I know, this is bad, but I’m picking my battles right now. I purchased the same probiotics that had been recommended to me years ago and I think I am breaking the cycle, though it’s precarious. I must be careful with what types of foods I consume so as not to upset the delicate balance I’m trying to create in my gut. I have begun the ritual of drinking one half cup of homemade ginger lemon water each morning upon waking. A mason jar filled with this healing liquid sits on my kitchen counter and it is the first thing I put in my body. 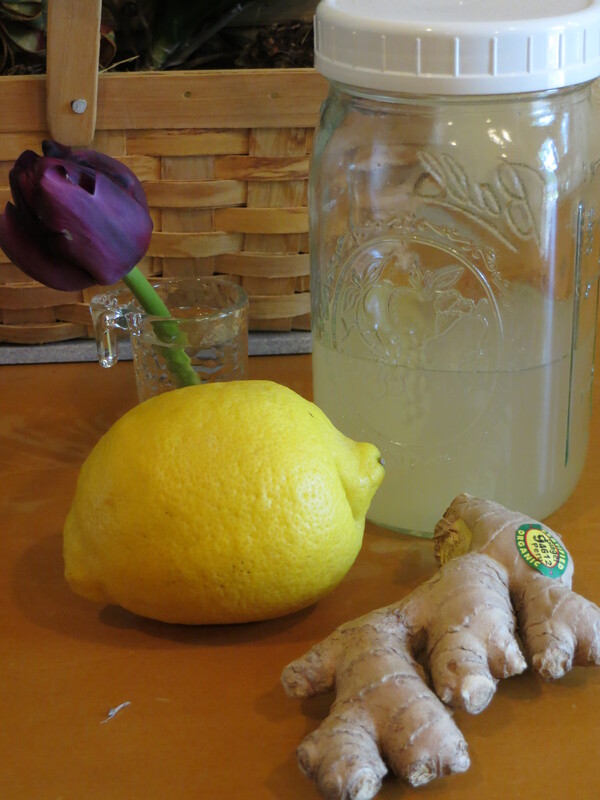 Lemon is a great detoxifier and ginger is a wonder spice filled with digestion friendly properties. It also gives my sluggish metabolism a kick start, an amazing side benefit that has resulted in a bit of weight loss. 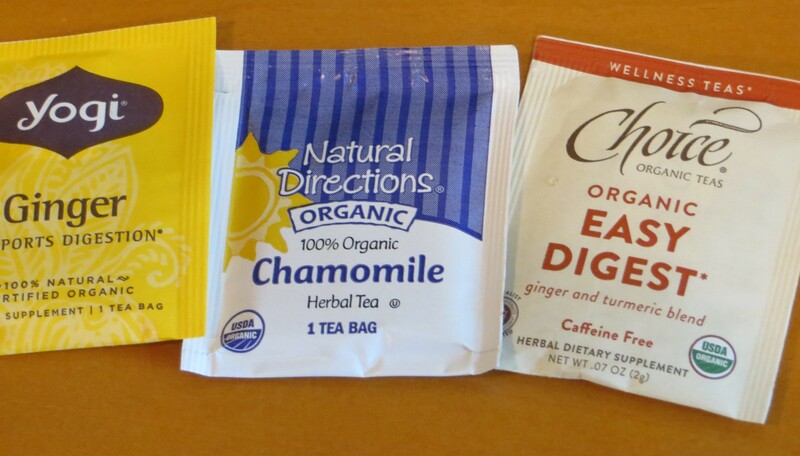 I drink licorice tea and chamomile tea through out the day. 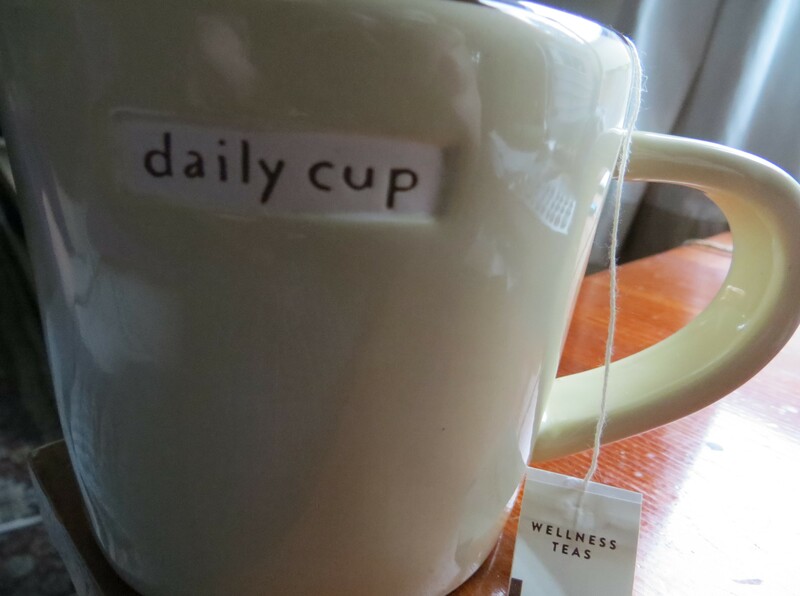 Chamomile calms the spasms of the esophagus when it is under duress and licorice reduces acid reflux. I deduced that I need to keep a grain free diet as it seems to exacerbate my symptoms. My diet has consisted of fresh made juices, smoothies and salads topped with various proteins. I am beginning to feel better, however if I stray from the strict diet I’ve created, my body reacts and lets me know I better stay the path. My co-worker on the other hand, says she has suffered from regular heartburn for 15 years. A recent story she shared about waking in the middle of the night and vomiting stomach acid horrified me. This is when I learned she has taken Prilosec for as many years as she has suffered. I explained to her that what she thinks is helping is actually systematically destroying her digestive system and making her ailments worse. While Prilosec does suppress the secretion of stomach acids, over time it actually does the opposite. It takes time to heal your body from the affects of heart burn. Prilosec is the “quick fix” most people look for, which is unfortunately the way of our society these days. Kick the symptoms and keep on moving. This is all prilosec does. It reduces symptoms, but it does not heal. 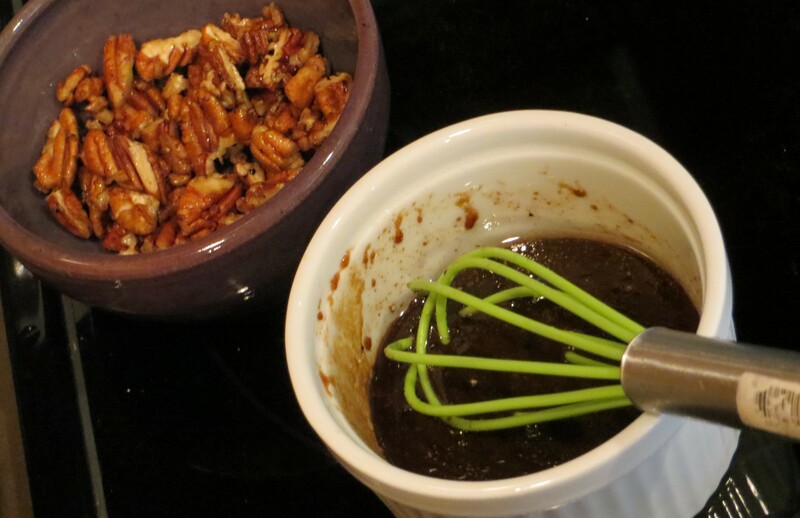 Here’s a look at what I’ve been eating and drinking to heal my malady. It has taken time; about two weeks. I still haven’t remedied all my symptoms, but I am much better. To me, it’s worth the work and time. I want to heal my body, not cover my symptoms. Ginger lemon water- Fill a pan with filtered water, add one half of a medium sized lemon and about a two inch knob of fresh ginger. Set on stove top and heat to boiling. Lower heat and simmer for 30 minutes to an hour. 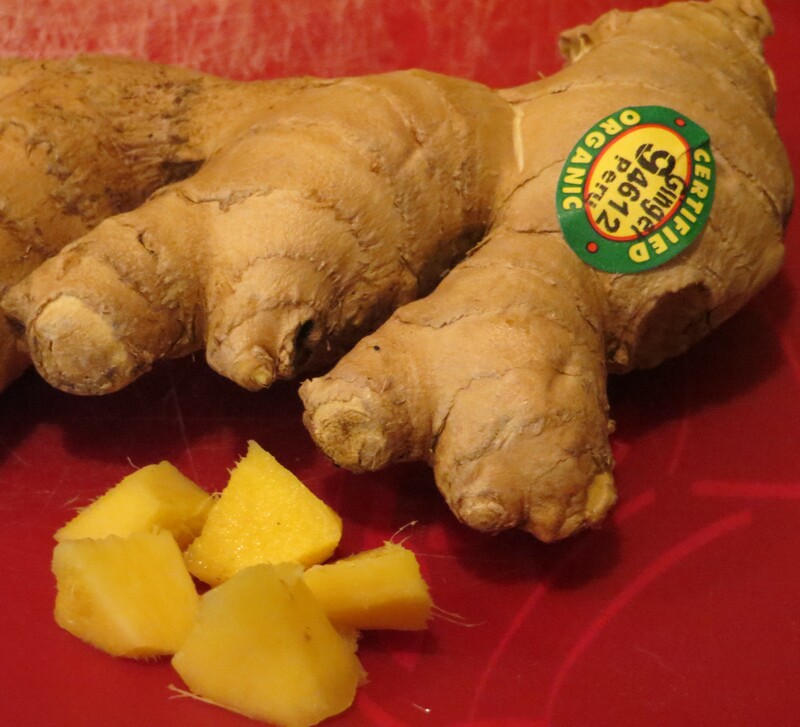 The goal is to extract all the goodness you can from the lemon and the ginger. 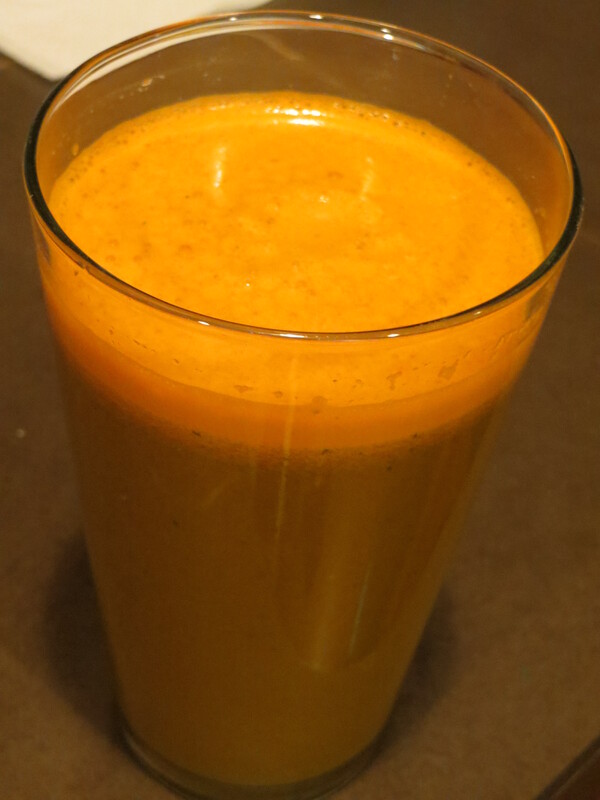 A nice carrot ginger juice soothes a rumbly tummy. I have been getting creative with proteins and veggies. Our lettuce, spinach and arugula are growing well and producing delicious greens for meals. I love grilling season!!! Here are some grass fed, organic tip steaks getting the heat! 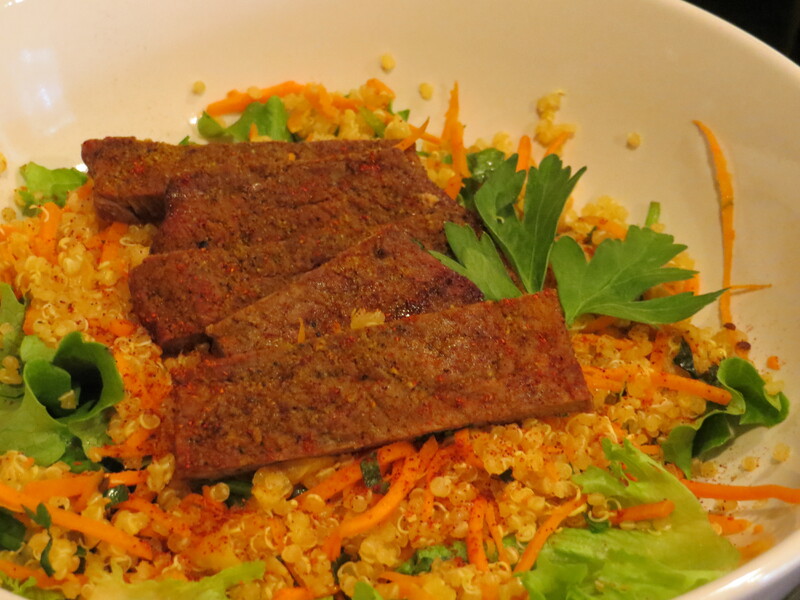 freshly grilled beef on top of a bed of quinoa, carrot shreds, various spices and a mix of greens from our garden! More grilled meat!! This time it’s chicken breast sitting on a delicious mix of veggies. There’s shredded raw yams and carrots, minced fresh ginger, sliced white onions, candied pecans made with pure maple syrup all on top of more yummy green veggies from our garden! 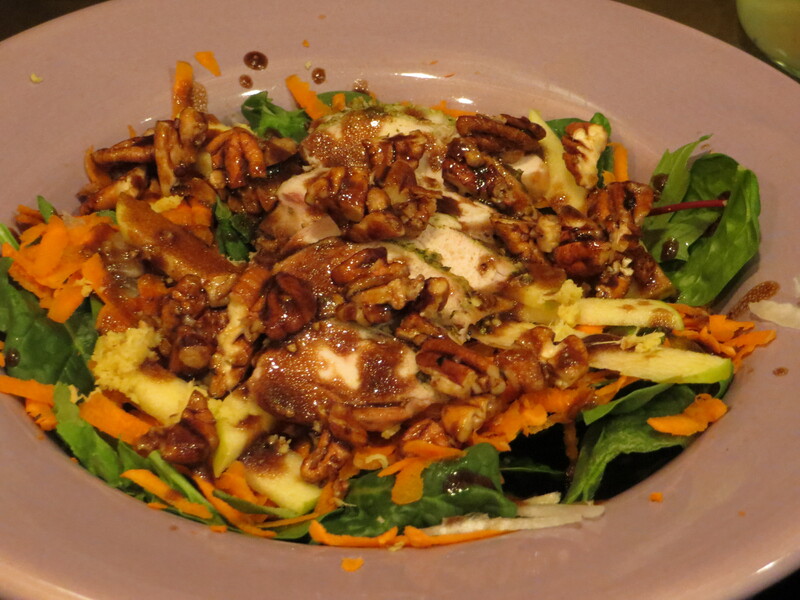 A Dijon vinaigrette sprinkled on this salad was delightful! I drove past a funeral procession on my way home from work this afternoon. Instantaneously, I felt a wave of grief wash over me and I began to cry. I was completely powerless over my response. It just happened. I know the raw pain that those people in the procession are experiencing; it took me right back. It is too fresh for me and still so painful. Grief is an interesting emotion. At any given moment such as this, I find myself in such anguish and unbelievable sorrow. In the past week or so my predominant and annoying grief emotion has been anxiety. This anxiety gives me butterfly tummy, makes me feel jittery, on edge because something has to be done, right?? I easily become irritable. I pace a lot. There is one serious storm that brews in my mind; a whirlpool of agitated thoughts keeping me from clear focus on nothing more complex than “just getting by”. I’m sure I am not the only one with this feeling. Some days doesn’t it seem like it takes every bit of energy you can muster to get out of bed and do your regular morning routines? Right now it stops me and I must force myself toward tasks if I want anything accomplished. I find a mantra and push forward. Sometimes it’s as simple as “this will help you feel better”. I’ve tried a number of over the counter supplements and homeopathic remedies for this anxiety with a great degree of success however, there are some days when my mind is weak, my body tired and emotions rule. I simply do the best I can and that is enough. It is always easy enough for me to be mindful of what food goes in my body. Even in high stress times, I don’t often sway toward extremes. I do however tend to favor one food group which often leads to tummy unhappiness. In an effort to be more diverse and add beneficial nutrition to my diet I have been drinking juices and smoothies often. Juicing is a pain. I’m just going to say it. It is messy. It’s time consuming. There is a lot of produce that goes in and very little comes out in comparison. With that said, this is one of those tasks where my mantra is useful. Because the kitchen is an easy and calming place for me, it doesn’t take long to soothe my scattered mind. When I drink fresh made juice it’s like mega vitamins zap my brain at lightening speed helping me to feel alert, alive, energetic and yes, even anxiety free. In combination with my current supplements I have had a few less miserable days. I expect that I will cope with grief for a while. I give myself room for those days when I just “get by” and I know that this too shall pass. 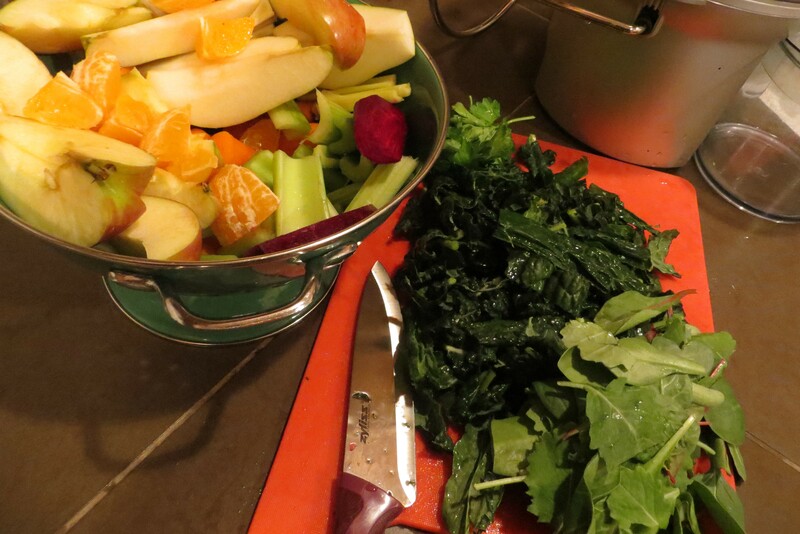 I will help myself to feel rejuvenated by keeping a regular routine of juicing. The pros of this care taking technique far out way the cons. My goal is to feel better! 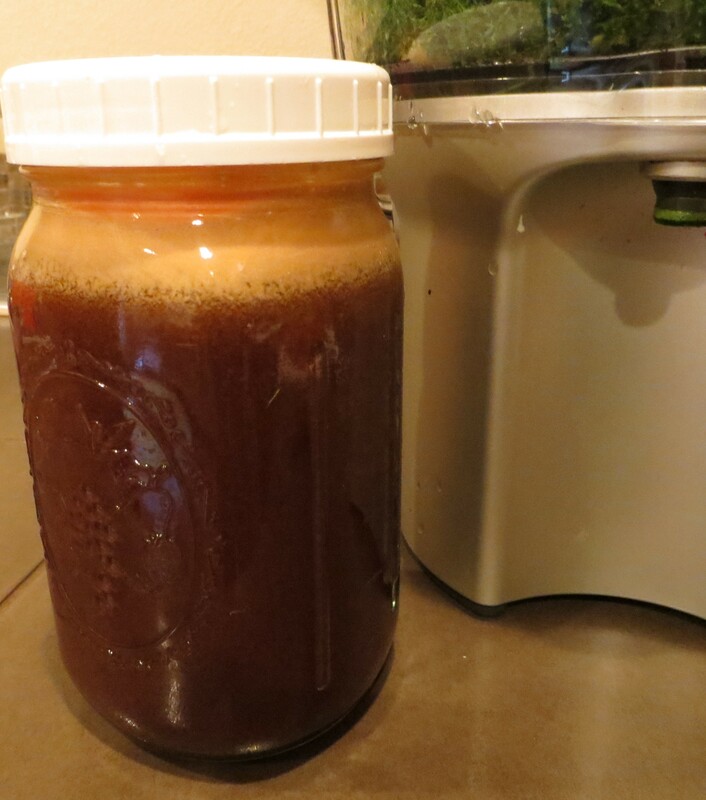 In whatever way you may need to feel better I encourage you to try juicing. This juice is amazing. Drink a rainbow today! push through juicer and enjoy immediately! !